A first half goal by Paul McLaughlin won Colville Park AFC’s second consecutive Scottish Amateur Cup final at a sunkissed Hampden Park on Sunday afternoon. 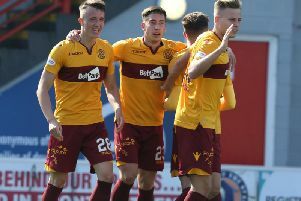 Twelve months on from beating Fife team Leven United 2-1, McLaughlin’s strike saw off Glasgow outfit Southside 1-0 and led to joyous post match scenes among the Motherwell squad and their manager Michael Kennedy. The first chance of the match had earlier come Colville’s way after just two minutes, when Chrissy Craig was bearing down on goal but failed to control the ball after Liam Cusack’s cross from the right. Craig then shot over from outside the box before another close call for Colville as Steven Greenlees headed just wide at the back post after Darren Miller’s long free-kick into the box. But the Motherwell outfit did hit the front after 33 minutes when McLaughlin knocked the ball past former Motherwell goalie Lee Hollis after Miller’s free-kick had been headed down by Greenlees. It was a deserved lead for Colville in a scrappy game in which 90 per cent of the chances were created by them. Miller’s free-kicks in the direction of Greenlees were an obvious Colville attacking ploy and a similar combination almost bore fruit for the league champions again after 43 minutes when Miller’s diagonal setpiece was headed over by Greenlees. Southside’s Steven Waddell shot just wide of Ryan Ward’s left hand post after 55 minutes in a rare foray forward by the underdogs. But normal service was soon resumed as another Miller free-kick was met by Stephen McDevitt, whose header was stopped by Hollis. A flurry of late substitutions made it a stop/start last half hour for the 752 crowd, with Colville sub Alex Clearie heading wide after a late corner before fellow replacement Kevin Fotheringham shot off target with the final chance.